GeneHunter is a powerful software solution for optimization problems which utilizes a state-of-the-art genetic algorithm methodology. 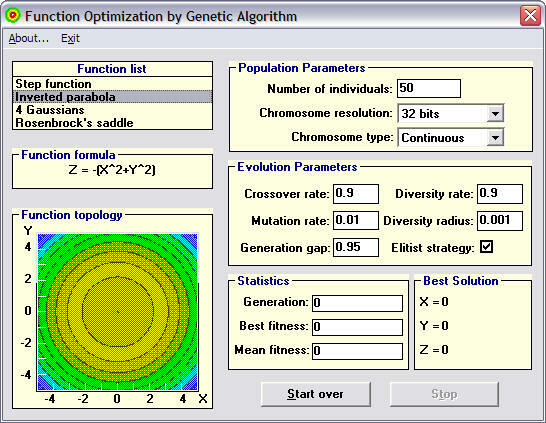 GeneHunter includes an Excel Add-In which allows the user to run an optimization problem from Microsoft Excel, as well as a Dynamic Link Library of genetic algorithm functions that may be called from programming languages such as Microsoft® Visual Basic or C.
Genetic algorithms (GAs) seek to solve optimization problems using the methods of evolution, specifically survival of the fittest. In a typical optimization problem, there are a number of variables which control the process, and a formula or algorithm which combines the variables to fully model the process. The problem is then to find the values of the variables which optimize the model in some way. If the model is a formula, then we will usually be seeking the maximum or minimum value of the formula. There are many mathematical methods which can optimize problems of this nature (and very quickly) for fairly "well-behaved" problems. These traditional methods tend to break down when the problem is not so "well-behaved." Before describing how a genetic algorithm can be applied to an optimization problem, let us draw the evolutionary parallel. The theory is that a population of a certain species will, after many generations, adapt to live better in its environment. For example, if the species is an animal that lives mainly in a swampy area, it may eventually evolve with webbed feet. The reason is that the members of this population, which we call individuals, will tend to die if they are poor swimmers which cannot easily get food, and live to reproduce if they are good swimmers. The offspring of two good swimmers will probably be good swimmers because they will usually carry genetic traits of their parents, such as slight webbing between their toes. These genetic traits are carried in the chromosomes of the individuals. GeneHunter solves optimization problems in the same way. It will create a population of possible solutions to the problem. The individuals in this population will carry chromosomes which are the values of variables of the problem. GeneHunter actually solves your problem by allowing the less fit individuals in the population to die, and selectively breeding the most fit individuals. The process is called selection, as in selection of the fittest. GeneHunter takes two individuals and mates them (crossover), the offspring of the mated pair will receive some of the characteristics of the mother and some of the father. In nature, offspring often have some slight abnormalities, called mutations. Usually, these mutations are disabling and inhibit the ability of the offspring to survive, but once in a while, they improve the fitness of the individual. GeneHunter occasionally causes mutations to occur. As GeneHunter mates fit individuals and mutates some, the population undergoes a generation change. The population will then consist of offspring plus a few of the older individuals which GeneHunter allows to survive to the next generation. These are the most fit in the population, and we will want to keep them breeding. These most fit individuals are called elite individuals. After dozens or even hundreds of "generations," a population eventually emerges wherein the individuals will solve the problem very well. In fact, the most fit (elite) individual will be an optimum or close to optimum solution. Creating a problem solving model in GeneHunter requires that you enter the relevant data into a Microsoft Excel spreadsheet and specify problem solving parameters in a GeneHunter dialog screen. The GeneHunter Dialog screen enables you to identify the cells in your spreadsheet that are involved in solving your problem. You also list constraints that should be met by the solution. The Fitness Function box tells GeneHunter the location of the cell which contains the formula that measures GeneHunter's success in finding a solution to your problem. The formula may be created using any of the Excel functions that are available from the Insert menu, such as average. You may also use Excel macros or Visual Basic functions to create a formula that allows you to solve very complex problems. You may even use a neural net to model the process if you don't have an appropriate mathematical formula! If you are creating a sales application that considers variables such as advertising, distribution, and research and development budgets, the goal might be to maximize revenue, and you would want to maximize the fitness function. In another application, the goal might be to develop an oil that reaches a specified quality by adjusting the amounts of additives that go into making the oil. Chromosomes are the variables whose values are adjusted in order to solve the problem. Their value is related in some way to the fitness function. GeneHunter uses two types of chromosomes to solve the problems. Continuous Chromosomes are used when the adjustable cell can take on a value that may be within a continuous range, such as the value 1.5 with the range 0 to 2. Continuous chromosomes may also be integers if you want to restrict the search space. Enumerated Chromosomes are used when the problem involves finding an optimal combination of tasks, resources, duties, etc. Limit the range of values that GeneHunter will search for a solution, thus limiting the time that GeneHunter will take to find an optimal solution. This is called hard constraint. Add restrictions or sub-goals to the original fitness function. This is called a soft constraint. GeneHunter attempts to find solutions that meet the soft constraints, as well as optimize the fitness function. Includes the following example programs in an Excel workbook. This example serves as a tutorial for GeneHunter. A camp leader needs to purchase the food supplies for an overnight camping trip for a group of 20 people. He has to minimize the food costs while still providing the appropriate number of servings of grains, fruits, vegetables, dairy products, meats, and sweets in order to meet the camp's recommended dietary standards. You may have problems to solve that are similar to this one, such as minimizing the cost of an advertising budget while reaching a targeted number of people in different demographic groups by adjusting the dollars spent on different types of advertising. GeneHunter's goal is to minimize the food cost while maximizing diet quality by varying the number of servings per person for each food group. The Portfolio example is representative of many problems which require you to optimally group items with different values into sets (for example, students into academic competition teams, workers of different skills into job teams, etc.). In the example, a money manager has a list of stocks, each with a different value, that he wants to separate into six groups, based upon the specified percentages of his entire portfolio. In this example, GeneHunter generates rules to predict a rise in the NYSE index. To learn more about this example and stock market prediction with genetic algorithms, see Predict the NYSE Using Rules Generated by GeneHunter. You will learn more about using neural networks and genetic algorithms together later on. "Bob's Deli" is just one way in which you can actually use GeneHunter to build and train a neural network without any other neural network products or algorithms. Bob has decided to train a neural net to predict his sandwich sales so that he will have enough ingredients and staff available each day at lunch. He has been keeping records of sales for 16 weeks. He uses temperature, daily precipitation, the day of the week, and payday for the company across the street as inputs to his neural network. In this example, we use GeneHunter to train Bob's neural network to predict the number of sandwiches he should be prepared to sell each day at lunchtime in his Deli. GeneHunter's genetic algorithm is used to find the neural network's weights. The Traveling Salesman Problem is a well-known problem which has become a comparison benchmark test for different algorithms used to solve combinatorial optimization problems. A salesperson must make a complete closed tour of a given number of cities. All cities are connected by roads, and each city must be visited only once. GeneHunter solves this problem by minimizing the total tour length, and by changing the order of the city numbers. One of the most important uses of genetic algorithms is their ability to create optimum schedules for just about any reasonable sized scheduling problem. There may be quite an opportunity for entrepreneurs to build genetic algorithm schedulers for specific job scheduling environments. You can use our example as a model. In our example, we are the manager of a small circuit board assembly plant that assembles, wires, solders and tests a number of circuit boards of different types each day. There are a total of five workstations that each board must go through, but each workstation may have several specialists on duty (or machines in the case of a fully automated shop), each of which can independently fully perform the duties of that workstation. There are several types of circuit boards manufactured at this shop, and each type requires a different amount of time at a particular workstation. Therefore, there is the potential that some specialists or machines will have work to do at various times, because boards at the previous stations require long job times. GeneHunter creates a schedule for manufacturing the boards in a minimum amount of time. The Portfolio Optimization example is more representative of a real world problem than the simple bin packing example "Portfolio". In true portfolio optimization, a trader or fund manager would seek to minimize his/her risk while simultaneously trying to maximize return. The trader does this by modeling his/her high return portfolio after an existing diversified portfolio, such as the S&P 500. The trader picks a number of stocks, for example, that he/she believes will offer a high rate of return. The genetic algorithm is used to minimize the risk by helping to adjust the portfolio so that it behaves like the more diversified S&P 500 "portfolio". It is possible to use GeneHunter to find mathematical models of data, much like the models that could be built with multiple non-linear regression analysis. The Polynomial Approximation example uses GeneHunter to determine the coefficients of five independent variables along with the power of each variable. The example could be extended to using more complicated mathematical models. Many users want to include the power of a genetic algorithm in their applications but prefer to design their own user interface or to speed up the time that is required by Excel to compute complicated fitness functions. To meet these needs, GeneHunter also includes a complete genetic algorithm function library that is available in a Dynamic Link Library called GALIB.DLL. The library includes functions for creating populations, evolving the populations by setting parameters such as crossover, mutation, and diversity (sometimes called "creep" in the literature), measuring the fitness values of individuals in the population, and updating the population into the next generation. The user has the option of creating individuals with either continuous or enumerated chromosomes. Crossover, one of GeneHunter's operators, involves a process in which GeneHunter takes two fit individuals and mates them. The offspring will receive some characteristics from both parents. Mutation is an operator that also serves to continue evolution. Instead of combining traits from two parents, however, mutation changes a single individual by randomly changing the value in one of the chromosomes. The diversity operator also changes a single individual, but changes each chromosome in small increments rather than drastically changing a single chromosome. Extinction, another operator, allows you to destroy all but the elite of the population. It is similar to a plague destroying most of the population, and refreshing it with a large new set of individuals. The GeneHunter manual includes a comprehensive explanation of each function, including argument descriptions, sample function calls, and a listing of related functions. The manual contains separate chapters describing how to program applications with continuous and enumerated chromosomes, including detailed code listings with corresponding explanations. The GALIB.DLL enables you to create applications that can simultaneously run up to 128 populations. The function MakeChromosomePool enables you to quickly create multiple similar chromosomes for applications such as optimizing the weights in a neural network. GeneHunter even allows you to mix continuous and enumerated chromosomes in a single population. Any applications you build with the GeneHunter programming interface may be distributed only within your company or specific government agency. That is, you may not allow anyone outside of your company to use it if your company purchased it (or outside of your agency if your government agency purchased it). If you purchased GeneHunter personally, you may not distribute your applications outside of your immediate family. If you desire to sell or distribute a GeneHunter application outside of your company, agency, or family, you must negotiate a separate license from Ward Systems Group, Inc. The GeneHunter installation include s the source code for three Visual Basic examples (plus C code for one example). Executable versions of these examples are installed on your computer during GeneHunter setup. Traders often spend years developing trading schemes based on complex formulas or rules they either learned in college or on the job. Using GeneHunter, however, you may be able to produce rules that are more adept at predicting financial markets. One of the exciting aspects of genetic algorithms is the fact that the more imagination you use in creating fitness functions and their corresponding use of variables (chromosomes), the more you will be able to develop powerful applications. For example, it is not too hard to use GeneHunter to find "rules" to process data. One of the most interesting applications of rule generation may be in the generation of rules to predict various financial markets. GeneHunter include s a sample application for creating rules for predicting financial markets. If the close 5 days ago is greater than the close 1 day ago and if the low 2 days ago is less than the high 7 days ago, then the NYSE will rise tomorrow. The concept of using a genetic algorithm to create the rules can be expanded to include finding optimum rules to process data, schedule airline flights or merchandise delivery, etc. Artificial neural networks were originally designed to model the pattern recognition abilities of the brain. They have been used extensively for many practical predictive and data classification tasks. There are many ways neural networks can be trained, and using a genetic algorithm is one of those ways. The Bob's Deli example shows you how to do this without any neural network products. The integration of traditionally trained neural nets and genetic algorithms is a fruitful area of research, and there are already many new and exciting ways to merge the technologies. If you own one of Ward Systems Group's neural network programs (e.g. NeuroShell 2 or the Run-Time Option for NeuroShell Predictor or Classifier), then the integration of the technologies can be fairly easy. Neural networks can be trained to find the fitness function if there are enough available samples of fitnesses already measured. Both NeuroShell 2 and the Run-Time Option for NeuroShell Predictor and Classifier have functions that can be executed from Excel spreadsheets to fire these neural nets so that they can become the GeneHunter fitness function. Then, use GeneHunter to find an optimal set of inputs. By this, we mean the best set of inputs; the set that optimizes the process you are modeling. Solve an optimization problem from a Microsoft Excel spreadsheet. Identify cells in your spreadsheet that are involved in solving your problem. Specify genetic algorithm parameters and list constraints that must be met by the solution. Examples demonstrate the different types of problems that GeneHunter may help you solve. Adjustable crossover and mutation rates, as well as generation gap. Experiment with parameters and specifications in the example programs in the Excel interface. GeneHunter works with both NeuroShell® 2 and the NeuroShell Predictor and Classifier Run-Time option. Generates rules more adept at predicting various financial markets. Free runtime license with restrictions. Visual Basic source code available for GeneHunter examples. C code example also provided. Construct applications with both continuous and enumerated chromosomes. Designed especially for Microsoft's Visual Basic, Visual Basic for Applications, or Access Basic. Runs with other languages which call DLLs under Windows, such as Visual C++ and Visual Basic. Installation creates a program group from which you can view example programs created with Visual Basic and Borland C++ that use GALIB.DLL. *The limits mentioned are program limits. Your computer may not contain enough memory for large problems, and some large problems may not be solvable even if they are within the limits. The GeneHunter® Excel Add-In allows you to save "runner-up solutions" in addition to the best solution. This feature will allow you to try near optimal combinations of values for adjustable cells that may in fact be a more practical solution to your problem. The user may specify how many (N) runner-up solutions should be kept after evolution is finished. These N best solutions are stored in a separate worksheet in the Excel workbook. This option can be turned on/off as needed. The default setting is off. Several fitness functions can be set up to optimize simultaneously. In addition to the main fitness function the user can enter a list of additional fitness functions to be optimized in the same run. The goal of each fitness function (maximize/minimize/search for a specific value) is set independently. This feature will allow you to control more than one facet of an optimization problem. Hard constraints (also known as ranges) and soft constraints (secondary fitness functions) are entered separately. Ranges (maximum and minimum values of chromosomes) can be set by referencing cells on the worksheet containing the minimum and maximum values. You can set these values directly on the worksheet without going through the GeneHunter dialog box. The user can add a tolerance and a priority for each soft constraint entered. The purpose of the tolerance is to tell GeneHunter when it has done a sufficient job. For example, if your constraint is that cell B4 must be less than cell B6, then you may want to instruct GeneHunter that if they are within plus or minus .5, then the solution is acceptable. The priority tells GeneHunter that some constraints are more important than others in case they cannot all be met. Priorities can be set to "low", "medium", or "high". GeneHunter allows the user to control the evolution of the initial population using the random number generator. Some users may want to begin with the same population each time and vary other factors in the optimization process. This is done by using the same random number seed each time, which is the default setting. Others may want to begin with a different population each evolution in order to find different solutions. You may do this by selecting a different random number seed. GeneHunter can display a graph of the progress of an optimization run. GeneHunter can display a graph of the best fitness function versus generation number. The graph is a regular Microsoft Excel chart that you can format using Excel. View this graph to see if the genetic algorithm is progressing in finding a solution. In this category, we present information about new Artificial Intelligence products as they hit the marketplace. The first installment provides an inside view of a genetic algorithm package from Frederick, MD-based Ward Systems Group. "Survival of the fittest" is the law of nature that genetic algorithms attempt to emulate. Survival of the fittest may also be the law of software marketing. GeneHunter, a new user-friendly fast-running genetic algorithm software package from Ward Systems Group, hopes to demonstrate that it is very fit indeed. Introduced this month, GeneHunter works in two ways. It's callable from Microsoft Excel spreadsheets, and accessible via function calls in a Dynamic Link Library (DLL). The function calls -- unique to GeneHunter -- are similar to the neural network function calls in NeuroWindows, Ward System Group's neural net DLL for Windows. Design artificial systems software that retained the important mechanisms of natural systems. People have known Holland's work for two decades. But Ward Systems Group founder and President Steven Ward notes that only the last five years have seen a large number of successful applications of this work to a range of business problems. "A genetic algorithm is an encoding of the variables of an optimization problem," says Ward. "The essential genetic algorithm maintains a set of individuals. Think of the set of variables in an individual as a potential solution to a problem. The evolutionary parallel is that a population of a certain species will, over many generations, adapt in an increasingly better manner to its environment. Ward draws what looks like a dog's paw on a whiteboard. (It turns out to be an illustration of a webbed foot.) "An example might be an animal that lives mainly in a swampy area. It may develop webbed feet to better survive in its environment," Ward says. "The offspring of two slightly web-footed animals are likely to carry the genetic traits of their parents such as increased webbing between the toes. The individual animal's chromosomes carry these genetic traits. "Similarly, GeneHunter solves an optimization problem by creating a 'population' of individual solutions to the problem. The individuals in this population carry chromosomes -- or variables -- which are the values of the problem. Chromosomes consist of units (hidden from the user) called genes. "Several types of 'chromosomes' are in GeneHunter -- continuous, integer, and enumerated. A continuous chromosome consists of either 8, 16, or 32 genes, implemented in the computer as binary bits. The three sizes of chromosomes are chromosome precision. GeneHunter provides two types of enumerated chromosomes: repeating gene and unique genes. A continuous chromosome has two distinct values of a gene, 0 and 1, called alleles. "So let's say we set up a population of 100 individuals," Ward continues. "Each one is a potential solution to a problem. With GeneHunter, you attempt to measure the fitness of an individual in order to decide if it will survive or not. The measure of how well an individual solves a problem is called a fitness function." Regardless of the problem-type, the genetic algorithm searches for the fittest individuals, and ranks them by fitness. It "marries" the fittest individuals, producing offspring. A crossover operator carries out this operation. The genetic algorithm then evaluates the next generation of the population, again using the fitness function as a criterion, eliminating unfit individuals while fit individuals marry and produce offspring. The best individuals in the set undergo crossover and mutation to produce new individuals that in turn are presumably better solutions to the problem. "As more generations are born," Ward explains, "solutions to the problem continue to get better because the fitness keeps increasing, since marrying means merging the best characteristics of both individuals. To keep 'inbreeding' down, we program the occurrence of a 'mutation' every so often. This mirrors nature. Mutated offspring occasionally have some slight abnormalities. Usually these mutations are disabling and inhibit the ability of the children to survive, but once in a while they improve the fitness of the individual -- like toes stuck together in a weblike fashion." After GeneHunter mates fit individuals and mutates some, the population undergoes a generation change. At this point, the population consists of offspring plus a few of the older individuals which GeneHunter allows to survive to the next "generation" because they are the fittest in the population. These fittest individuals are called elite individuals. After dozens or even hundreds of "generations", a population eventually emerges whose individuals solve the target problem very well. In fact, the fittest (elite) individual will be an optimum or close to optimum solution. To work with GeneHunter, an Excel add-in tool, you enter the relevant data into an Excel spreadsheet and enter a description of the problem into a GeneHunter dialog box opened from the Excel Tools Menu. Here's an example of GeneHunter at work. Suppose you have to buy supplies for an overnight camping trip for 20 people. Your goal is to minimize food cost while meeting or exceeding recommended dietary standards. Changing the number of servings of one food group affects the number of servings from the other food groups, and cost per serving varies substantially from one food group to the next. Figure 2 shows an example of camping trip data in Excel. Column B holds the six essential food groups. Column C contains the recommended percentage of total diet for each food group. Column D computes each food group's actual percentage of the total diet. The entire data set of combinations of the number of servings for each food group is the population. In this example, GeneHunter automatically changes the number of servings of food from each food group in Column E (the chromosomes) in order to minimize the budget constraint in cell G15, the Fitness Function. At the same time, GeneHunter maximizes diet quality in cell G16. Fitness Function Cell G15 in Figure 2 calculates the total cost of the camping food budget by summing up the total cost of servings in each food group in column G. The total cost of servings for each food group is calculated by multiplying the number of servings in column E by the cost per serving in column F, and multiplying that value by 20 (the total number of people in the group). Figure 2 Camping trip in Excel. Although only one Fitness Function Cell is allowed, GeneHunter allows the user to work with sub-goals when finding an optimum solution, in this case, diet quality. Diet quality is a constraint which is set before running the program (see Figure 3). 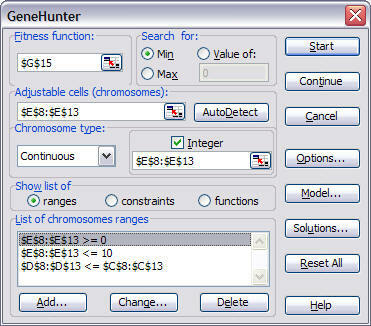 Constraints allow the user to limit how long GeneHunter will search for a solution. For example, in this case, constraints for $E8 to $E13 have been set to <=20 (the number of servings per person). Figure 3 Diet quality is a constraint which is set up before running the program. Once the parameters are in Excel, the user presses the Start button and GeneHunter begins its survival of the fittest calculations -- determining, in this case, the optimum number of servings which will minimize the budget while increasing diet quality. "The concept of being able to generate rules to find an optimum way to do something has huge potential. There may be a time when genetic algorithm packages can program computers. You can build strings of code with a genetic algorithm. "When we first introduced NeuroShell 1, we could only think of four or five applications for it," Ward concludes, "but our users have since applied NeuroShell to thousands of creative uses that we never would have thought of. The whole industry grew from people who learned the technique and applied it to their own domain of expertise. We believe the same thing will happen with genetic algorithms. People will see what genetic algorithms can do and light bulbs will come on in their minds." Contributing Editor Lisa Lewinson is President of Northstar Consulting Services, Inc. which specializes in the development of corporate data mining and expert systems applications. support@wardsystems.com Copyright © 1997-2019 Ward Systems Group, Inc. All rights reserved.